Immunosuppressed patients are at greater risk of unusual infections. The authors present the case of a woman with giant-cell arteritis, on oral steroids, who developed cavitating pneumonia due to co-infection with Asperigillus and Nocardia. Reports of such co-infection are rare in the literature. This case highlights the importance of considering rare pathogens in immunosuppressed patients who present with non-specific symptoms, as well as the impact of such pathogens on clinical management. Another important issue is the need for prophylaxis against Nocardia spp. in immunocompromised patients. 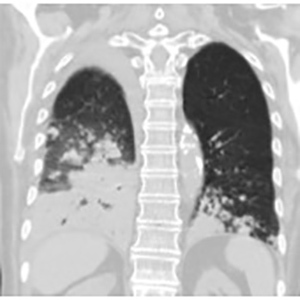 DP, Parida JR, Chowdhury AC, Agarwal V. Pulmonary co-infection with Nocardia and Asperigillus in a patient with adult-onset Still’s disease receiving steroids and tacrolimus. BMJ Case Rep 2014; pii: bcr2014207335, doi: 10.1136/bcr-2014-207335. Hamadani M, Benson DM Jr, Blum W, et al. Pulmonary Nocardia and Aspergillus co-infection in a patient with chronic graft-versus-host disease. Transpl Infect Dis2008;10:24–26. Cooper CJ, Said S, Popp M, Alkhateeb H, Rodriguez C, Porres Aguilar M, Alozie O. A complicated case of an immunocompetent patient with disseminated nocardiosis. Infect Dis Rep 2014;6:5327. Wilson JW. Nocardiosis: updates and clinical overview. Mayo Clin Proc 2012;87:403–407. Yu S, Wang J, Fang Q, Zhang J, Yan F. Specific clinical manifestations of Nocardia: a case report and literature review. Exp Ther Med 2016;12(4):2021–2026. Sirisena D, Al Swedan L, Jayne D, Chakravarty K. A case of systemic nocardiosis in systemic vasculitis and a review of the literature. Singapore Med J 2013;54:e127–e130. Martínez Tomás R, Menéndez Villanueva R, Reyes Calzada S, et al. Pulmonary nocardiosis: risk factors and outcomes. Respirology 2007;12:394. Georghiou PR, Blacklock ZM. Infection with Nocardia species in Queensland. A review of 102 clinical isolates. Med J Aust 1992;156:692. Fatahi-Bafghi M. Nocardiosis from 1888 to 2017. Microb Pathog 2018;114:369–384. van Dam AP, Pruijm MT, Harinck BI, et al. Pneumonia involving Aspergillus and Rhizopus spp. after a near-drowning incident with subsequent Nocardia cyriacigeorgici and N. farcinica coinfection as a late complication. Eur J Clin Microbiol Infect Dis 2005;24:61–64. Roth A, Andrees S, Reiner MK, Harmsen D, Mauch H. Phylogeny of the genus Nocardia based on reassessed 16S rRNA gene sequences reveals underspeciation and division of strains classified as Nocardia asteroides into three established species and two unnamed taxons. J Clin Microbiol 2003;41:851–856. Conville PS, Fischer SH, Cartwright CP, Witebsky FG. Identification of Nocardia species by restriction endonuclease analysis of an amplified portion of 16S rRNA gene. J Clin Microbiol 2007;45:1146–1151. Namnyak S, Uddin M, Ahmod N. Nocardia cyriacigeorgica bacteraemia presenting with cytomegalovirus disease and rapidly fatal pneumonia in a renal transplant patient: a case report. J Med Case Rep 2011;5:228. Trastoy R, Manso T, García X, Barbeito G, Navarro D, Rascado P, Pérez del Molino ML. Coinfección pulmonar por Nocardia cyriacigeorgica y Aspergillus fumigatus. Rev Esp Quimioter 2017;30:123–126. Salta G, Bouw MJ, Tendeiro T, Saraiva Z, Reis M, Mello e Castro M, Girão A. Nocardiose pulmonar. Acta Médica Portuguesa 2002;15:441–445. Ambrosioni J, Lew D, Garbino J. Nocardiosis: update clinical review and experience at a tertiary center. Infection 2010;38:89–97. Shojaei H, Hashemi A, Heidarieh P, Eshraghi S, Khosravi AR, Daei Naser A. Clinical isolation of Nocardia cyriacigeorgica from patients with various clinical manifestations, the first report from Iran. Med Mycol J 2011;52:39−43. Akashdeep Singh, Deepinder Chhina, Soni RK, Chandan Kakkar, Sidhu US. Clinical spectrum and outcome of pulmonary nocardiosis: 5-year experience. Lung India 2016;33:398–403. Peixinho P, Sabino T, Duarte C, Cruz T, Bragança N. Aspergilose pulmonar invasiva. Acta Médica Portuguesa 2003;16:97–99. Valdezate S, Garrido N, Carrasco G, et al. Epidemiology and susceptibility to antimicrobial agents of the main Nocardia species in Spain. J Antimicrob Chemother 2017;72:754. McTaggart LR, Doucet J, Witkowska M, Richardson SE. Antimicrobial susceptibility among clinical Nocardia species identified by multilocus sequence analysis. Antimicrob Agents Chemother 2015;59:269.